Taper compensating heads make square edged parts. 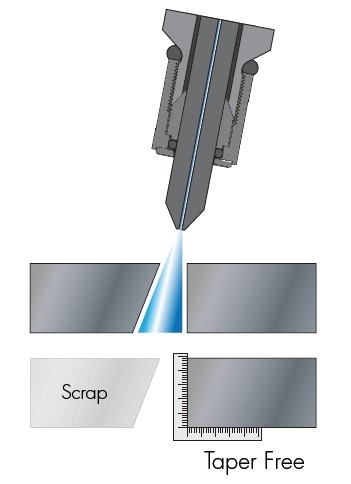 All of our waterjets are equipped with a dynamic Tilt-A-Jet head that compensates for taper to ensure part squareness. The taper caused by the naturally angled kerf doesn’t disappear, it just gets moved to the scrap part of the material. This allows your part to be made with clean, square edges. Check out our equipment list below for waterjet cutting and material finishing equipment. If you’d like more details click on the name of the equipment to go to its description on the Technology page.